Although, when it comes to matters of one’s careers, a degree by any other name is actually not the same. Rather, as it turns out, a degree which just claims to be a degree but is actually not can be extremely sour and distasteful. A popular example for this can be the 149 students who had joined the Union government-backed National Insurance Academy (NIA) with the aim of getting a MBA degree, but much to their surprise, they were in fact handed out diplomas instead of degrees. As the students appealed to the Bombay High Court for justice, the court said that there was no solid ground for the court to provide any relief to the students as it was the responsibility of the students to check the details of the course before seeking admission in the college. Just because a course is named MBA does not necessarily mean that it will offer a MBA degree. Admission to any given course must be taken on the peril of the students’ own wisdom and the judgment. More details about this can be read in the TOI newspaper. Much against the student’s plight, the judges said that “The court does not have powers to order that the diploma certificates be converted into a degree certificate”, and in case if the students do want to attain a degree, then the only alternative for them is to join another reputed college and do another degree course all over again! As appalling and shocking as it might sound, it is in fact the sour truth of life. Quite rightly stated by the judges that today, one can find institutes cropping up in every nook and corner of the country. Every school / college dropout / wealthy business man / politician seems to be opening up an educational institute these days. But just because they have opened up an institute of learning, does that really mean that they have got the authority to confer degrees to students? Besides, it is quite natural to assume that students who are applying to these Masters courses possess the appropriate knowledge and awareness to make wise decisions for their lives. They are not young kids in the age bracket of 14 to 17 years, rather, they are young adults, well above 21 years of age, and therefore, it is indeed their responsibility to not allow themselves to be duped by any person. 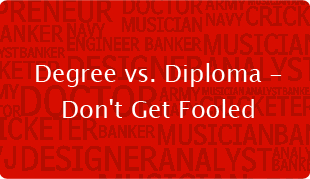 BUT WHETHER DEGREE OR DIPLOMA, WHAT DIFFERENCE DOES IT REALLY MAKE? Students who wish to get into the field of teaching or perhaps pursue further studies like Masters, M.Phil or PhD cannot do so with a diploma. They must necessarily have a degree in order to get into teaching or to study further, or for that matter, even to get into the government sector. However, if one wishes to pursue only a job, that too with a private company, then a diploma or certificate course is as good as any other. If in case students wish to apply to reputed universities abroad, then a diploma will not serve them the purpose for getting a high scholarship. Many universities, particularly in the US and UK, offer more funding for degree courses as compared to diploma courses. Other than this, many employers prefer a degree course over a diploma. However, for certain specialized industries such as fashion or hospitality, a diploma will work just fine. For example: NID offers a diploma in design, which is by far the most reputed course in the country. Even IIMs are offering diploma courses, and considering the brand and repute of the institute, either a diploma or a degree will not make much of a difference. DEGREE OR DIPLOMA, WHICH IS BETTER? Times are changing and many employers are now opening up to the idea of accepting diplomas. However, that said, it is important to note that a diploma from just about any random institute will not serve the purpose. The repute of the institute plays a crucial role in deciding the fate of a diploma or a certificate course. However, as highlighted previously, if one wishes to get into teaching or to pursue further studies, then a degree is quintessential. At the end of the day, it is the student who has to decide what category of course they wish to pursue and what is their ultimate goal and career path. Making random and impulsive decisions when it comes to matters of career will only spoil their own future. Therefore, students must mandatorily take responsibility for their own careers and seek complete details about the course they wish to pursue, the institute they are applying to, the future prospect of the course, the faculty, the curriculum, the management, as well as the affiliation of the degree that will be conferred on them, and also, whether the degree / diploma fits in with their career path or not.